6220: Mystery Radio (tent) @ 17.35. SINPO 54454. Strong signal. 6220: Mystery Radio (tent) @ 21.38. SINPO 44354. Playing ABBA and UB40. 6005: Radio 700 @ 12.57. SINPO 34232. 6210: UNID station @ 12.08-12.23. SINPO 23222. 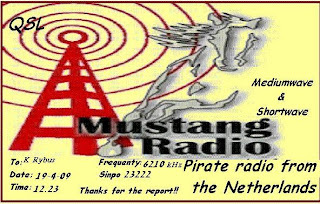 6220: Mystery Radio @ 13.47. SINPO 44344. 6305: UNID station @ 11.31. SINPO 44444. Strong signal. Sign-off at 11.45 UTC. 6374,40: Radio Alice (tent) @ 13.08. SINPO 33333. 6380,70: UNID station @ 12.25. SINPO 33433. 6380,70: UNID station @ 12.53. SINPO 33333. Signing off soon, technical problems seem to be a reason. 6376,50: UNID station @ 13.59. SINPO 43333. Later drifted away to 6379,40 kHz. 6523,20: Radio Ramona @ 11.46. SINPO 33333. Several IDs. 6870: Radio Playback International @ 12.34. SINPO 33233. 6986: UNID station (presumably Connection Radio) @ 12.46. SINPO 22232. Soon drifted slowly (in several minutes) up to 6990 kHz and later to 6991,20 kHz. 6991,20: Connection Radio (tent) @ 13.15. SINPO 21222.